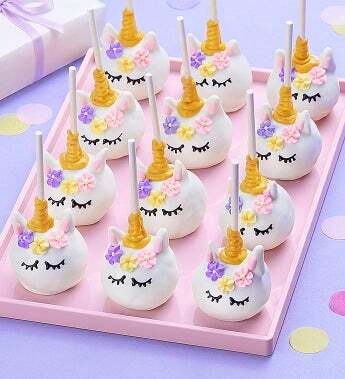 Send wonderful, magical good wishes with these incredibly delicious and adorable unicorn truffle cake pops! These rich, dark and moist chocolate truffle cakes on a stick are so incredibly decadent, it’s no surprise that celebrities love’em, too. These trend-forward treats are lovingly hand-made by a small artisan bakery that has been featured on The Today Show and Rachel Ray! The luscious truffle cake centers are covered with a deliciously crisp, confectionary exterior of sweet icing, then hand-decorated to perfection. Easy to share, these gourmet truffle cake pops are an indescribably delicious, A-list dessert that they’re certain to love!